Special small-batch beer release of Hondo Ale in honor of Hondo, the first Peregrine Falcon to nest at UWO. Come on down to Fifth Ward Brewing for this family-friendly event. A free Root Beer for the kids. Adults will be able to purchase a refreshing Hondo Ale, brewed especially for this occasion. Hondo Ale is a light and easy drinking blonde ale brewed with millet, a grain consumed by humans around the world and commonly found in bird seed mixes. Hopped with Willamette hops grown in Washington State, expect a pleasant floral hoppiness with a touch of graininess from the malted millet and barley. 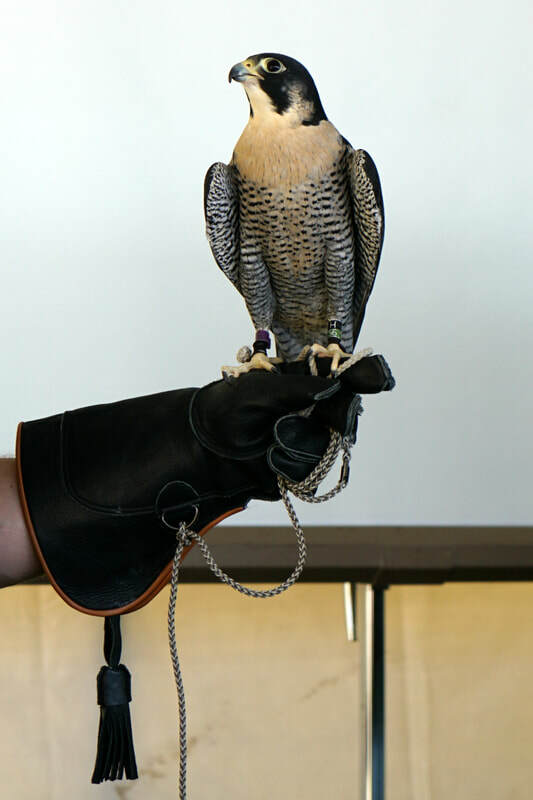 Hondo is a Peregrine Falcon who became a local celebrity when he and his mate Deborah chose the University of Wisconsin Oshkosh Gruenhagen Conference Center as a nesting site in early 2011. The University promptly constructed and mounted a nest box equipped with a webcam to share their enthusiasm with the public. They had their first set of chicks that spring. In 2012, Hondo and Deborah returned to raise their second brood at the UW Oshkosh nest box. During that summer, Hondo was believed to be out on a morning hunting run to feed his and Deborah’s young when he collided with a vehicle along Highway 41. Luckily, a Good Samaritan found him and he was eventually transported to Aves Wildlife Alliance, a licensed wildlife rehabilitation facility in Neenah. He had sustained injuries to his right wing and leg. Initially, the hope was that the injuries were not substantial, and that he could be released within a short period to help Deborah finish rearing their young, but x-rays revealed fractures in his shoulder and collar bone areas. Hondo was hospitalized for several months at Aves and then transferred to a falconer for flight conditioning and further evaluation for an additional several months. Falcons need to be able to tuck their wings in order to dive at high speeds (called “stoops”) that can exceed 200 mph, and sometimes from as high as 3,000 ft. It is essential for them to be able to hunt this way in order to survive in the wild. Hondo has a permanent reduced range of motion in his right shoulder, due to his injuries and lingering arthritis. He was deemed not releasable. When a wild animal cannot successfully be released back into the wild it can be a difficult transition for the animal. The US Fish and Wildlife Service and Wisconsin Department of Natural Resources have guidelines that aid and govern keeping a wild animal in captivity. The falconer and staff of Aves Wildlife Alliance made suitable progress towards Hondo’s continued life in captivity. The US Fish and Wildlife Service agreed, and Aves Wildlife Alliance was granted an educational bird permit for him. With continued training, Hondo has become a great ambassador of native birds and wildlife by accompanying Aves Wildlife Alliance at educational programs. Photo of Hondo courtesy of Collections by Carol.